Who wants to go skydiving? Is it just for a particular personality? Is there an outstanding truth to be found, a larger question to be answered that those who wish to take this high risk seek to gain? Or do these adventurers simply have a death wish? Yet, psychologists tell us that people who take these risks are important for the continuation of the species. How can that be? Skydivers come from many paths: there are engineers, students, mechanics and nurses to name just a few. But the one common origin is an affinity for high-risk sport. Interestingly, this is an extraordinarily restorative activity; it works as an excellent stress reliever. One doesn’t think of anything else when on a sky dive; none of life’s distractions seep in. There is only the adrenaline and the focus after which is physical and mental renewal. Adrenaline generates the surge of energy, and this is regarded as a necessary part of health and, indeed, survival. So, stepping out of an airplane might be considered by our psychologist as an ingredient for the survival of the species; however, there are other advantages. It is said that the fear of jumping out of that plane makes one mentally tough. Then, there is the mind control necessary to go against perceived danger and the need to direct ones thoughts out that open door. There is an increased awareness of one’s surroundings. And finally, there is the confidence and sense of accomplishment knowing that fear has been met with control, a quality that now flows into other areas of one’s life. For the beginner, there are several things that come to mind: the sky dive itself including the thrill, the wind, the noise, the rip cord, and the landing. The first jumps are usually tandem; what does this entail and what is the expense? When does the beginner get to jump alone? And for the long haul, when this beginner becomes a regular jumper, what equipment is needed and how much will it all cost to pursue this adventure regularly? Sky diving is a rush, but why? Why the animation? Best answer is that when one steps out of a flying airplane, there is only freefall until the canopy is employed. About ten seconds after the initial jump, the diver begins falling at a constant speed, therefore able to experience the surroundings. Color is a big part of the process as the vast landscape below is observed. A feeling of being able to touch the clouds is also part of the sensation. Wind is another facet; it blows through one’s hair or in one’s face, but there is no doubt that the body is flying on the wind. Noise is bad at the beginning of the jump: opening the door out of the aircraft; the rush of wind passed the open door; engine noise of the aircraft; and for the beginner, the last-minute reminders from the instructor. No matter what built-in fear the beginner has of pulling his own ripcord, it is not something to worry about. This is because he doesn’t have to as a beginner. There are a series of steps beginning with on the ground class sessions, static line jumps and a dummy pull before a student is actually allowed the responsibility of pulling his or her own ripcord. By the time a jumper has made five static line jumps, he is permitted to pull the cord himself, but he must do it on the same day as the last static line jump so nothing is forgotten. The last aspect of facing that initial thrill as a beginner is the landing. Some pertinent facts about today’s parachutes should be reassuring. For instance, most canopies are rectangular and tend to act like an airfoil, so they are more like gliders than umbrellas. They are exceptionally maneuverable, so that jumpers are able to land almost anywhere they wish. The shape promotes soft landings even for the novice who is able, for the most part, to land standing up even on the first jump. The tandem jump consists of a student connected by way of a harness to an instructor. The instructor helps the student through all the steps of the jump from exit of the aircraft to landing. Not much instruction is required before making this type of jump, so it is a popular training method. Unfortunately, it can be expensive because the tandem master is responsible for safety, and the required equipment is different from single jumper rigs. Tandem systems use a drogue parachute that deploys briefly after the jump so that the skydivers’ terminal velocity is decreased. These systems also use larger main parachutes in order to support the weight of two bodies; the FAA insures that these rigs are equipped with both a main and a reserve canopy plus a device which automatically deploys the extra parachute if the skydivers are still in freefall below a certain altitude. 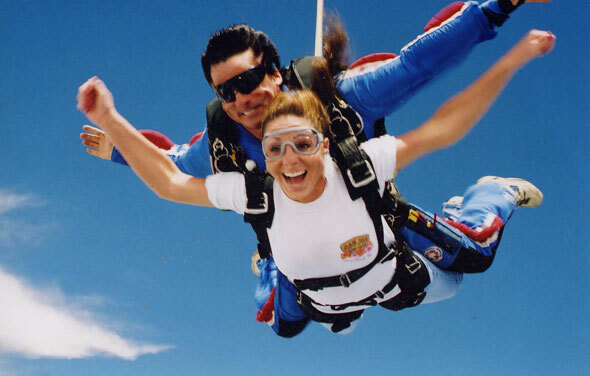 In most dropzones, tandem jumps cost a little over $200, but there is also the video which is made by an additional jumper used as training material in critiquing the jump. The cost for this is about $100 bringing the total for one tandem jump to around $300. Jumping alone is quite another matter since it takes a minimum of 15 jumps with an instructor’s supervision. The exception to this is the accelerated freefall which can be done in as little as seven jumps. Either way, one must procure a license through United States Parachute Association to fly alone. Regardless of which training program is chosen, the A license issued by USPA requires eight categories of proficiency to be certified. Each category has a series of skills and knowledge that must be achieved before moving on to the next category; once certified the skydiver is allowed to rent gear and jump at most dropzone locations throughout the country. The total cost is somewhere close to $1500. If the beginner becomes a certified skydiver the expense increases exponentially. One plan worth considering is to buy used equipment. Even so, with the purchase of a container, a reserve canopy, a main canopy, an automatic activation device, a helmet and an altimeter, the cost will be over $6,000. However, after the jumper is certified and has his own gear, each jump should only cost about $25. There are many sources for information on sky diving. On the Internet is http://www.uspa.org which is the website for the U.S governing body for sport parachuting. Here the jumper will find a list of member dropzones as well as myriad sorts of information on the sport. Another great resource for everything skydiving is http://www.dropzone.com. Skydiving Magazine is both a hardcopy information source that can be subscribed to as well as a website for additional information. So what is skydiving like and why would the beginner launch into this not so inexpensive hobby? It is pure freedom. For the first 45 to 60 seconds there is nothing but the flyer and the air. It is also relaxation. And it is the view, the sky, the horizon and the exquisite beauty of viewing the world with no obstructions. The skydiver is simply a part of the sky, and it is his playground. I Love to go on skydiving, it is my dream to go but I am scared actually.